ArtResize is a very practical tool that can surely be of great help to anyone that works in the publication of web contents, because it allows us to redimension, convert, rename and add watermarks to any file, being only necessary to configure the application and click a few times. 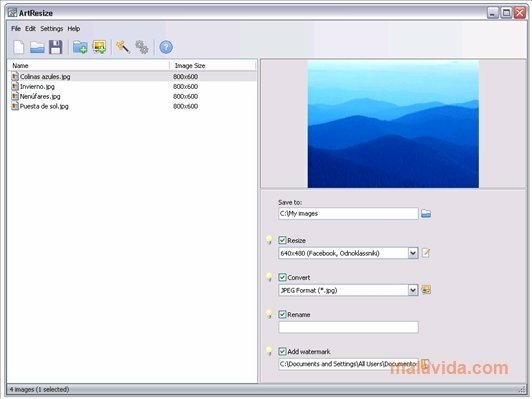 The program is capable of working with individual photos or to indicate a batch of files that need the same process applied, because its main objective is to be used to prepare images, before they become part of a web album. The interface is very gray, but very intuitive, because all the controls that we need will always be visible. It has a series of preset configurations ready to be used according to our needs, because we can find various templates for web services or mobile devices. 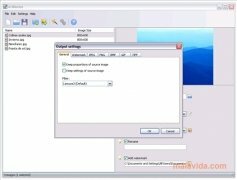 If you're looking for a solution that will allow you to handle various images the same way with a single click, download and install ArtResize on your computer.